In just 10 days, thousands of moms and dads (and future moms and dads!) will flock to the International Centre for the Spring BabyTime Show. The bi-annual event caters to parents-to-be all the way up to parents of toddlers. I've been attending the event every single season since I found out I was pregnant more than 2 years ago. In addition to the great shopping (of course! ), I've found a wealth of information from breast feeding to car seat safety and have even met Ann Douglas, author and parenting expert. I've visited with my mom, my best friend and my husband, and in the fall, even brought our toddler along for the ride. She, too, had a great time meeting some of her favourite characters, playing in the Fisher-Price zone and sampling some of the newest treats designed for toddlers' tastebuds. This year will be the first time I'm attending the event both as a mom to a toddler, while pregnant with baby #2. I'd like to think we're already pretty prepared when it comes to having a child, but having another is a completely different ball game. Still, there's tons to know and a lot of information to soak in. What else will I be checking out? More gear, of course. 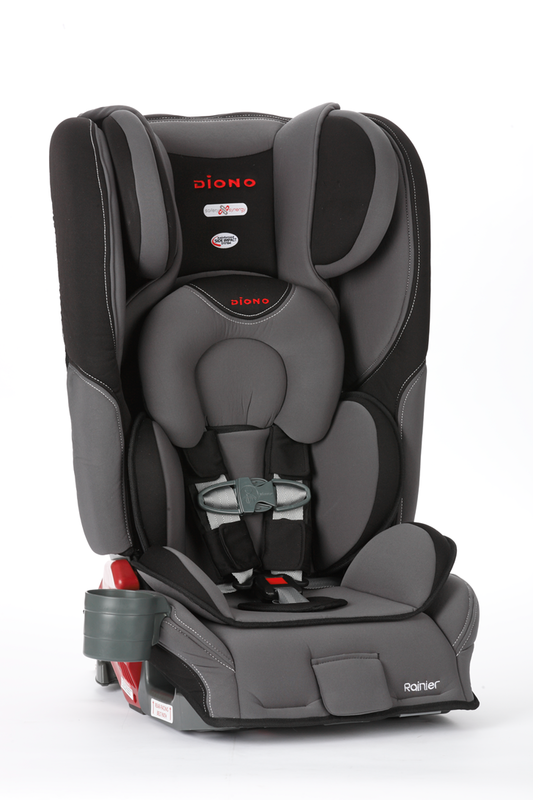 Diono has recently launched the Rainier, a new Convertible Car Seat with a full steel frame. This one can be used from 5-50 lbs rear facing and 22-65 lbs forward facing. It then turns into a booster for kids between 50-120 lbs. What's great about Diono, though? It's narrow enough to fit three car seats across in a mid-size vehicle. It retails for $379, but in my opinion, you can't put a price on your child's safety. Up next, some home decor, or nursery decor. I recently learned about Signature Little Ones, a local Vaughan-based company, who makes everything from personalized pillows to robes, growth charts, bedding and even stuff for mom and dad. This will be their first time at the BabyTime Show and I would love to see what they have for Isabelle and Baby #2. On a recent visit to one of our programs at Rogers TV, the girls from Signature Little Ones brought alone some personalized announcement pillows and I just fell in love with them. What a great gift idea and beautiful addition to your baby's nursery. Of course, there are so many great causes to learn about at the show, as well. I'm thrilled to learn that Mount Sinai Hospital Foundation will be in attendance promoting their Rock 'N Stroll. This is a super-unique fundraising walk to support high-risk births at Mount Sinai. While my preemie wasn't born at Mount Sinai, I do know some babies who were, and hold the NICU there, and the nurses and doctors in high regard. I think this is a wonderful way to support the cause. And lastly, you can't visit the show without spending a little bit of money on clothes or baby supplies! Sears Canada will be there, and you can register or pick up inexpensive and useful onesies or pjs, muslin blankets and bottles. Well.ca will also be around, and in the past, they've sold diapers! We'll see what's in store this time for this fabulous e-retailer. Leave your jackets in the car! Be patient! It can get quite busy and crowded with strollers, but it's worth the trip! And for a chance to win passes to the show, enter my Rafflecopter below! The BabyTime Show runs from April 25-27 from 10 a.m. - 6 p.m. at the International Centre. Disclaimer: I am an official BabyTime Show Ambassador and will be receiving special perks as part of my affiliation. All views expressed are my own. I just picked up the Baby Jogger City Select Double stroller and cannot wait to use it this summer to welcome our twin girls. Good luck on your search. I'm excited to see what unique gifts are out there for me to buy my friends who are expecting! Looking forward to seeing what natural health care product are out there. Talking to parenting experts and checking out the strollers. I really want to see the Dearborn Baby store. They have awesome deals there. All the deals & new products! Most people I know also have the City Select!!! Everything! I love discovering new products! I want to buy new products and get free samples. Attipas! I want to get my daughter a pair!